As some of you know, I intern for a global PR agency, and this week we had a fantastic opportunity: Debbie Wong, a leadership development expert, taught a career development workshop in which she answered our toughest questions about the job search, networking, resumes, cover letters, writing samples, interviews, negotiations, and pretty much everything in between. All of us who attended the session are graduating in May from either undergrad or grad school, so the tips were particularly focused on the means to the end: securing a job. But for those of you applying/interviewing for internships, or simply maintaining a strong network, Debbie’s advice is definitely universal. It’s no secret that I love this stuff, so I wanted to pass along my key takeaways from Debbie’s workshop. What is a corporate university and why should I care? A corporate university is a training program that a company sets in place to encourage constant learning and development for its employees. Corporate universities show that a company values its employees and also prioritizes continuing education, which is vital to any changing field. Debbie advises to ask about a company’s corporate university in your interview to get a sense of their values as an organization. I’ve been to some networking events. How can I stay in contact with the people I met? How do I turn those contacts into job prospects? Immediately after the event, email the people you met or connect with them on LinkedIn to follow up. Remind them of what you discussed. Set up alerts in your calendar every 6 months or so to remind yourself to reach out to your contacts who you haven’t spoken with in a while. 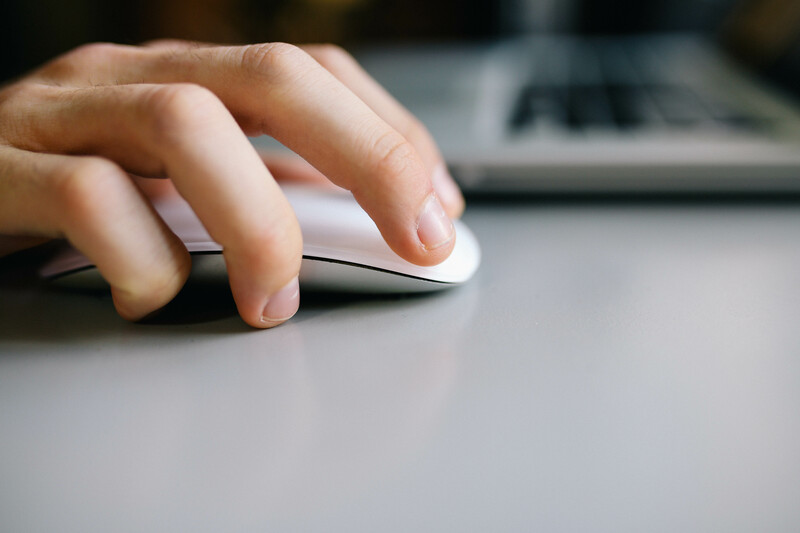 When you come across relevant article, send them their way with a brief note – “Saw this and thought of you!” Ask to hear more about their job and the career path they took to get there, otherwise known as an informational interview. Let them know you’re interested in the industry and are actively seeking jobs, but don’t take advantage of their mentorship. Any tips for creating a great resume? Begin your bullet points with strong active verbs in the past tense like “developed,” “managed,” “designed,” “created,” “initiated,” etc. Speaking of bullet points, use them – not paragraphs. What should I include in a writing sample? When a company asks for a writing sample, include a variety of options that showcase the breadth and depth of your skill set. Anything that is visually appealing is a plus! A mix of academic + internship projects, press releases, pitch letters, flyer designs, etc. should serve you well. What am I looking for in a job package besides salary? A offer package consists of more than your salary (which is, of course, important). It also can include everything from benefits, to tuition reimbursements, to paid time off (PTO). And of course, it depends on what you value. Perhaps you’ll be willing to accept a salary that’s lower than your goal in exchange for tons of paid vacation days. Debbie noted that your priorities will change in your 20s, 30s, 40s, and beyond, and what you negotiate for may change from job to job. I actually found a great article about this via Levo League about salary negotiations that I recommend checking out. Additional advice: try to avoid writing a salary amount in your cover letter/application. 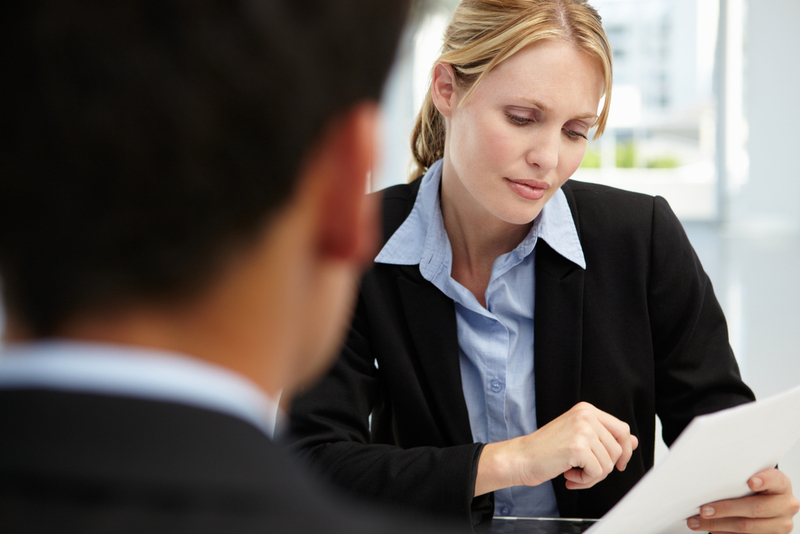 If the interviewer offers an amount, don’t just accept it – this lowers your value. People will not always give you more; you need to ask for it! Do you have any pressing questions about career development? Leave them in the comments! My brother just put down his deposit at Ohio State University, with an intended major in business, and since I’m graduating in May, I’ve been thinking about my own freshman year. So I thought I’d write a post for some of the younger readers – high school, early college – about finding a major/career that you’re really passionate about. Now, to be fair, I recently read a very thought-provoking article about the phrase “Do what you love, love what you do.” The piece discussed how this advice is only relevant to those with privilege, and diminishes the value and necessity of working-class jobs. So recognizing this important perspective, and understanding it’s significance, I’d like to still discuss the idea of finding happiness and passion in one’s career. My freshman year of college, I decided that since no major seemed to fit my interests perfectly, I was going to take advantage of American University’s offering and create my own interdisciplinary major, combining all my favorite areas of study. What would this major be? I looked at my interests and skills. I love to write, I’m a people person, I like social media, and events, and talking. I knew I wanted something creative, but not artistic (hey, gotta be realistic). I didn’t realize at the time that all of these interests were also relevant to branding, PR, marketing, advertising, and sales. I had a bit of a head start because I did journalism in high school and loved it. As co-editor-in-chief of my high school’s newspaper, I discovered my love for writing, leadership, and beautifully packaged information. So I pulled out the AU course book (yes, a physical book, with paper and everything) and looked for classes that fit my interests. In attempting to build my supermajor, I realized that what I wanted already existed under the name Public Communication. And, as they say, the rest is history. 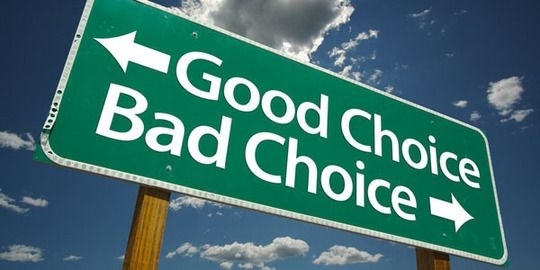 My advice to students entering college or early in college trying to choose their major/career is this: Just because it’s your major, doesn’t mean you’re making a decision about the rest of your life. Unless you’re already positive about a very technical career like engineering or medicine, choose a college with options that you can explore. Take advantage of your general education requirements and learn about different fields. You may hate the historical aspects of your anthropology class but leave with the takeaway that you’re interested in human behavior, and boom! You’ve found your way to psychology or sociology. Each positive and negative academic experience can lead to others, and if you take a critical look at what you got out of each one, it can help you find your way. On top of that, once you find your major and professional interests, classes are not enough. Internships and clubs on campus are what will help you gain a real understanding of the industry. It took me several internships doing in-house PR, agency PR, fashion, food & beverage, consumer goods, and B2B to finally understand what type of career I’m seeking, and what I’m really passionate about. This was my experience, and I’m sure that others came to decisions about careers and majors in different ways. I’d love to hear how you came to find your career passions, or if you have any questions, feel free to ask! For my final college semester I’m taking a class called PR Portfolio, which is essentially a public relations capstone class where we work in teams to create a PR program for an actual client. The class is amazing and my professor is fantastic – it’s basically a culmination of everything I’ve learned in AU’s School of Communication over the past four years. Another great thing the class does is prepare us for the “real world” – whatever that means. Each week my prof hosts Career Corner, where she tackles another topic we’ll need for after graduation, such as negotiating a salary, turning an internship into a full time job, etc. It’s pretty fab. Last week, we discussed interview outfits. 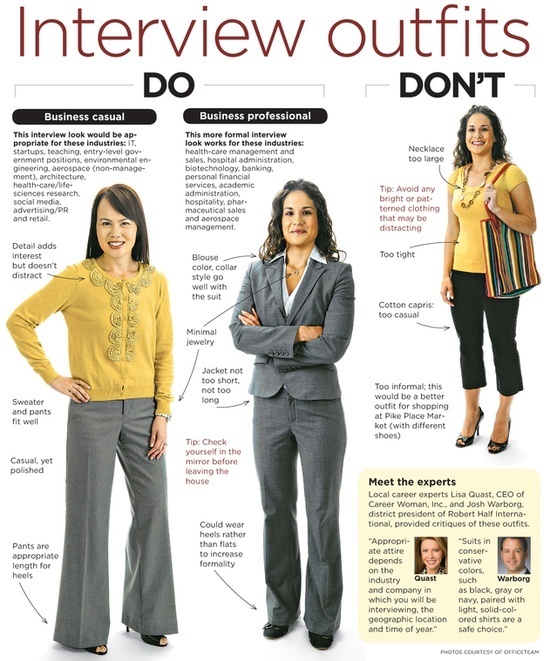 How do you dress to interview for a job in a field where each company’s dress code is vastly different? The professor showed us the following visual as a depiction of an appropriate PR interview outfit. A lot of the class, myself included, had some major problems with it. One classmate brought up the point that she would feel like a child dressing in her mother’s clothes in an outfit like this. Another mentioned that in an office where your interviewer might be rocking jeans and flip-flops, this seems off-message and inappropriately formal. I’ve interviewed and interned in many different office environments – I’ve worn outfits at different jobs that range from jeans and a t-shirt, to sky-high strappy heels, to corporate dresses. But at none of these jobs would a suit have been an appropriate interview outfit choice. So stop rambling, Stacey, and tell us what we should wear, right? 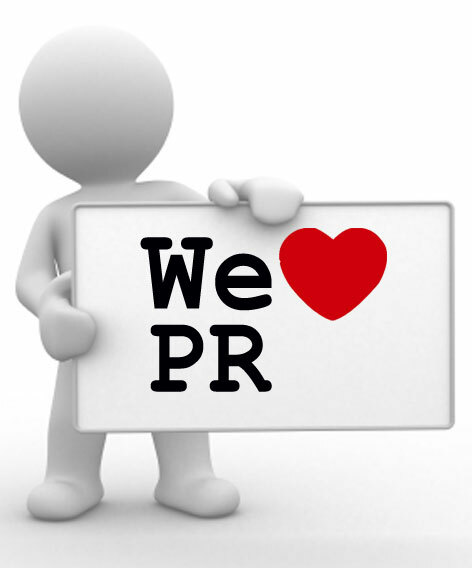 PR is a professional but creative field, and we need to represent our personal brand when interviewing. The outfit you choose is a huge part of that. Here’s how I feel about every interview (in the PR industry, to be fair) – dress professionally, dress appropriately, show your style & creativity. There’s a difference between being casual and being stylish. On top of that, the clothes you wear need to be of good quality (note: not necessarily expensive, just good quality! ), ironed, fit you appropriately, and they should also be comfortable! 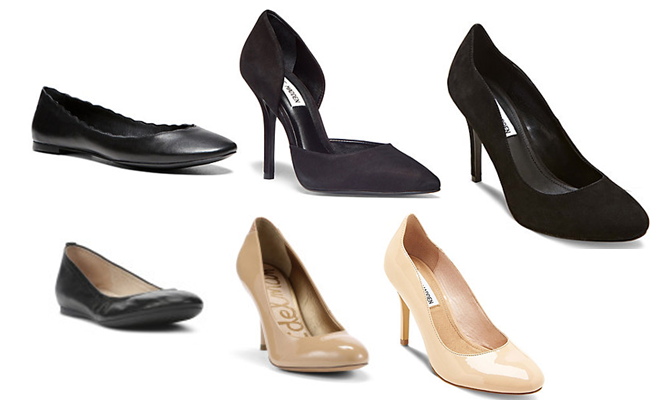 If you can’t walk in heels, please god, just wear flats (clean, leather or patent leather, black or neutral flats). Now, of course, you can always wear a skirt/blouse or pants/blouse combo, which is just as good! For tops, I recommend silk, tie neck or button down, etc. Dresses are just my outfit of choice – no tucking/bunching to deal with! Still not sure what to wear? Check out some options for Strategy in Stilettos-approved interview styles below! I’d love to hear/see what you wear to internship + job interviews, and what types of outfits you think are appropriate. 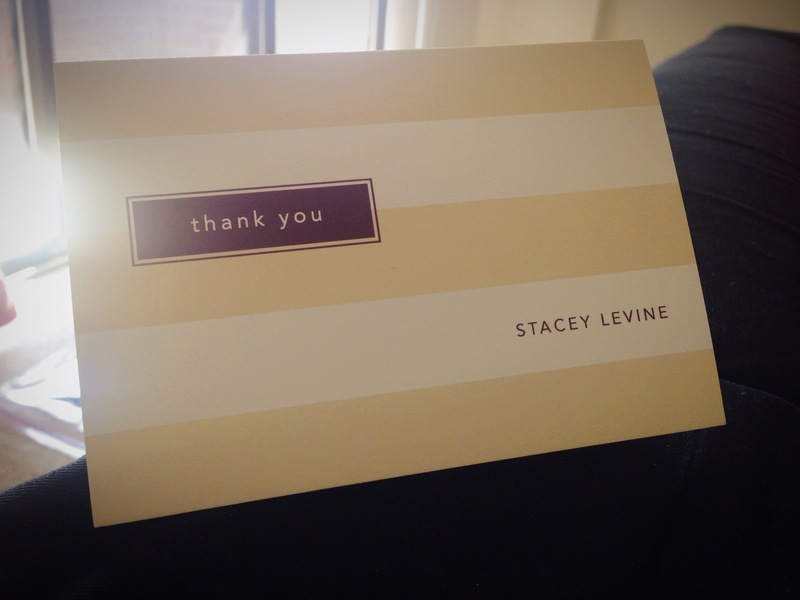 Share in the comments or tweet @staceyalevine! Hi all! Hope everyone is having a great summer! I know that lots of you are post-grads, and whether you’ve landed your dream job, you’re still doing the job search thang (did you just say thang? ), or you’re heading off to grad school (or Europe?) or anything in between, I’ve got something to help you out! Christie Garton, founder of University Chic (the girl’s guide to college life), has come out with a new book! 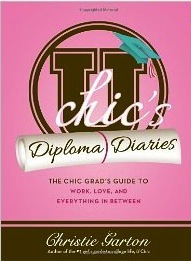 U Chic’s Diploma Diaries: The Chic Grad’s Guide to Work, Love and Everything In Between is a guide packed with true stories, tips, and tricks for the adventure that is life after college! The book includes everything from dealing with living arrangements, first jobs, dating essentials, being healthy and happy, the social scene and making friends post-graduation, and, last but not least, money matters. It also features inspirational stories from real women on finding success post-college. 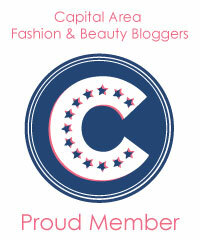 Want a chance to read all about it for yourself? You can buy the book on Amazon – or you can enter the giveaway by CLICKING HERE! The giveaway will be open from 8/12-8/23. You must live in the USA or Canada to enter. I attended a conference last week for interns in the fields of PR, advertising and marketing. While at that conference, as if it was fate (fate, I tell you!) I received this infographic in my inbox. And I loved it. I’m clearly the social media addict, to which my bff & former roomie Amanda can attest. Which are you? Last week I had the wonderful opportunity to attend, through American University’s School of Communication, a lunch + learn site visit trip to a large international PR firm. The agency’s original office is located in Washington, DC – one of its 90 global offices – so we headed to Farragut Square last Wednesday for a visit. Our group of 20 students had the opportunity to sit around a boardroom table, eating pizza and listening to presentations by various employees of the agency. We heard from a Senior VP, VP, Account Exec, and Asst. Account Exec, from four different departments. They really gave us a comprehensive looks at the values of the agency, the specific responsibilities of each department, the structure of account teams, and the factors that go into the entry level hiring process. The trip was hugely helpful to me, so I’d like to share with you all some of the key insights and takeaways I learned today! 1. Research is key. Analytics plays a huge role in shaping PR campaigns, because you want the work you’re doing to yield measurable results. 2. If you want to work in digital, you should naturally live + breathe a digital lifestyle outside of work. Otherwise, you won’t be up to date on the latest social media platforms, news, and technologies. 3. Hiring at agencies depends on winning bids for new business. Follow the news surrounding the agencies you want to work for – when they get new accounts, they’re more likely to be hiring. 4. When you need to send writing samples for an agency application, send: press releases, pitch letters, and online portfolios. 5. When interviewing for a job, there are a few things that can set you apart: a can-do attitude, willingness to go the extra mile, a flawlessly written resume/cover letter, showing that you’re a team player, and a good dose of common sense. 6. Things that won’t get you hired? Attitude/arrogance, vagueness and lack of detail in an interview, and being all talk and no content.